Adoption of HCI has grown significantly since coming to market and ESG research continues to confirm the popularity of HCI: in an ESG research study, 57% of respondents reported that they currently use or plan to use HCI solutions.1 This is not surprising given the factors driving them to consider HCI. Deployment drivers most cited by respondents include improved scalability (31%), total cost of ownership (28%), ease of deployment (26%), and simplified systems management (24%). 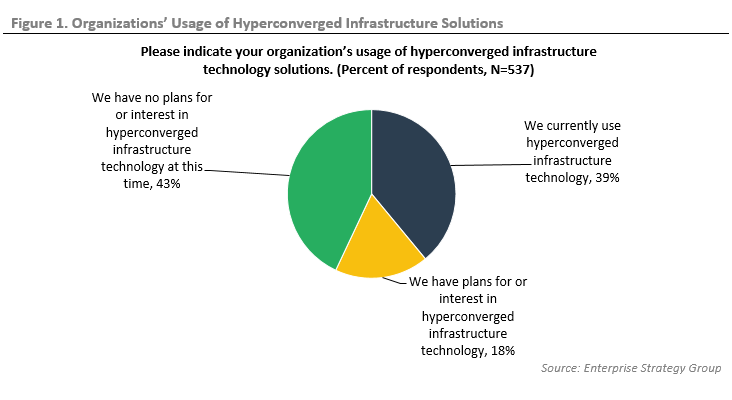 Organizations looking to move mission-critical workloads traditionally reserved for three-tiered architecture or converged infrastructure (CI) solutions to HCI need to give careful consideration to the solution they choose. Powering complex workloads can expose architectural deficiencies in an HCI solution not optimized to handle the workload requirements. An HCI platform deployed to support a tier-1 workload needs to not only provide high IOPs and low read/write latency, it needs to do so in a consistent, predictable manner. Predictable performance and low VM performance variability are critical to maximize end-user productivity across an organization. Simplicity is no longer the only priority; as more HCI solutions have come to market, the key buying criteria have expanded to include performance, but many solutions still cannot deliver the consistent high performance that mission-critical workloads demand. While first generation HCI architecture ran on x86 servers connected through commodity grade switches, the mission-critical nature of tier-1 workloads has led to software-only HCI companies validating their software on trusted enterprise grade hardware like Cisco UCS. Latency—While IOPS are an important performance indicator, latency as it relates to the application should also be considered when purchasing an HCI solution. Clustered environments like HCI can have multiple bottlenecks like storage performance, software responsiveness, and network throughput, all of which can contribute to application latency. Increased latency means decreased responsiveness of applications for users. Write latency—This is the time it takes for the storage controller to perform all the activities required to write data blocks, including determination of the proper location for the data, performance of overhead activities—block erase, copy, and “garbage collection,” then writing and acknowledging the write back to the host. HCI was conceived as the next step in the evolution of the modular data center concept. The goal was to simplify rack-level converged infrastructure (CI) to node-level deployments. Rather than three tiers of infrastructure managed through a common software platform, HCI combines virtualized compute and software-defined storage integrated through the software layer and deployed on a single chassis to create a node. Nodes are connected through network switches to form a shared pool of resources that can be scaled on demand by adding a new node to the cluster. There are distinct approaches that vendors have taken to bring HCI solutions to market that should be considered. Software-only HCI: This model focuses on the software layer used to integrate compute and storage into a single node. Users purchase the HCI software, which can then either be installed in-house or by a third party on industry-standard servers. Initial HCI deployments tended to support tier-2 or even tier-3 workloads, so it was common for the software to be deployed on off-the-shelf servers and connected through commodity switches to keep costs low. As HCI has matured and more critical workloads are being deployed, organizations have begun to demand that HCI run on trusted hardware platforms. It is important to note that not all hardware manufacturers carry the same validations, so it would be wise for potential users to read the fine print for these types of deployments. Deploying software on a hardware platform that does not carry validation from all parties can open the door to finger pointing and add a degree of risk that might be more than some organizations are willing to accept. Fully engineered HCI: This model is designed to provide the simplest way to deploy an HCI solution. Predominantly sold by tier-1 vendors, users selecting this approach get appliances built on trusted hardware platforms that are shipped with the software preinstalled. Vendors choose this approach because it enables them to engineer and optimize every component of HCI across computing, networking, and storage into a simple appliance offering. Fully engineered HCI solutions remove a level of risk by ensuring users are delivered factory-validated configurations whose operation and support are guaranteed by a single source for computing, networking, and storage software. It is important to note that some appliances are created through partnerships between hardware and software vendors and the level of optimization between the hardware and software layers can vary and affect overall performance. Cisco HyperFlex is a fully engineered hyperconverged system that combines compute and software-defined storage, as well as fully integrated networking optimized for the east-west traffic flow of an HCI platform. This fully integrated platform is designed to scale resources independently and deliver consistent high performance. 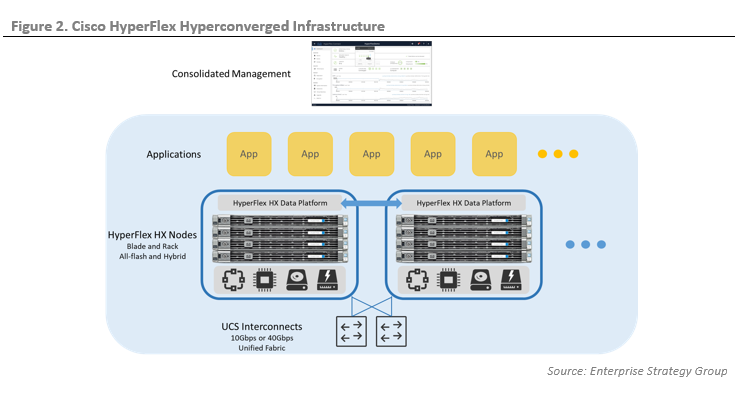 Cisco HyperFlex is engineered on Cisco UCS, combining the benefits of the UCS platform (such as policy-based automation for servers and networking) with those of the HX Data Platform’s distributed file system for hyperconvergence. It supports edge to edge workloads from mission-critical core data center applications to remote locations. The latest HX 3.0 update adds support for Microsoft Hyper-V in addition to VMware ESXi along with support for multi-cloud and containerized environments. HyperFlex deployments require a minimum three-node cluster for high availability, with data replicated across at least two nodes, and a third node to protect against single-node failure. The HX Data Platform handles all read and write requests for volumes accessed by the hypervisor. By striping data evenly across the cluster, network and storage hotspots are avoided, and VMs enjoy optimal I/O performance regardless of location. Writes go to local SSD cache and are replicated to remote SSD in parallel before the write is acknowledged. Reads are from local SSD if possible or retrieved from remote SSD. The log-structured file system is a distributed object store that uses a configurable SSD cache to speed reads and writes, with capacity in HDD (hybrid) or SSD (all-flash) persistent tiers. When data is de-staged to persistent tiers, a single sequential operation writes data to enhance performance. Inline deduplication and compression occur when data is de-staged; data is moved after the write is acknowledged so there is no performance impact. Cisco Unified Fabric—UCS 6200/6300 Fabric Interconnects enable software-defined networking. High bandwidth, low latency, and 40Gbps and 10Gbps connectivity in the fabric enable high availability as data is securely distributed and replicated across the cluster. The network enables HX clusters to scale easily and securely. The single hop architecture is designed to maximize the efficiency of the storage software to enhance overall cluster performance. Cisco Application Centric Infrastructure (ACI) for automated provisioning. ACI enables automation of network deployment, application services, security polices, and workload placement per defined service profiles. This provides faster, more accurate, more secure, lower cost deployments. ACI automatically routes traffic to optimize performance and resource utilization and re-routes traffic around hotspots for optimal performance. Choice of-industry leading hypervisors including VMware ESXi and vCenter as well as Microsoft Hyper-V. The hypervisor and management application come pre-installed, providing a familiar management interface for all hardware and software. Independent scaling. Different from other HCI systems, HyperFlex can independently scale compute and storage resources without the need to add full nodes to the cluster. Users can easily incorporate compute-only nodes with bare UCS servers through the Fabric Interconnects to add additional compute to the cluster, or if more storage is needed, add individual drives to each node; data is automatically rebalanced. This provides the right resources for different application needs, instead of scaling in pre-defined node increments that also add additional software licensing costs. Testing was conducted using industry-standard tools and methodologies and was focused on comparing the performance of Cisco’s fully engineered HCI solution—HyperFlex—with two software-only HCI offerings from leading vendors validated to run on Cisco UCS hardware within their listed hardware compatibility guidelines. The bulk of the testing used HCIBench and HXBench, tools designed to test the performance of HCI clusters running virtual machines. Both tools leverage Oracle’s Vdbench tool and automate the end-to-end process that includes deploying test VMs, coordinating workload runs, aggregating test results, and collecting data. The test bed included a four-node HyperFlex HX220c version 2.6 cluster. Comparative software-only HCI solutions were running UCS C220 and C240 four-node systems with similar configurations. Configuration details are listed in Table 1. OLTP tests were run with four VMs and a 3.2TB working set, while the mixed workload test used 140 VMs (35 VMs per node), each with 4 vCPUs, 4 GB RAM, one 40GB disk, and running RHEL version 7.2. The working set size was 5.6 TB. Tests were run for a minimum of one hour and up to five hours, with a five-minute ramp-up before each test and a minimum one-hour cool-down between tests. Before every test was run, each VM was primed with written data by the test tool. This ensures that the test is reading “real” data and writing over existing blocks and not simply returning null or zero values directly from memory. This happens when data is not primed so it is an important step to ensure that the test accurately reflects how data is read and written in an application environment. Priming of this large working set can take many hours to complete but is a wise investment in time to get more accurate performance results. Testing was performed using I/O profiles designed to emulate complex, mission-critical workloads, including OLTP using Oracle and SQL Server backends, as well as virtual application server and desktop activity. Block sizes were assigned according to the applications being emulated, with 100% random data access. VMs by nature generate random I/O by combining I/O from multiple applications and workloads. It is important to note that all tests were run with compression and deduplication active on the Cisco HX cluster. Alternative vendor’s solutions offer the ability to disable compression and deduplication, so tests were run in both modes for those systems. 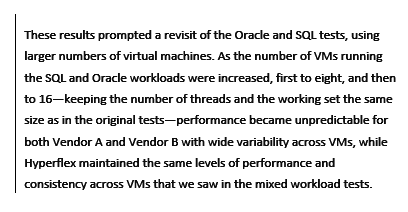 First, ESG Lab looked at an OLTP workload designed to emulate an Oracle environment.5 Vdbench was used to create a workload that exercised different transfer sizes and read/write ratios. In the Vdbench profile, the deduplication ratio was set to 3 with a unit size of 4 KB and the compressibility ratio also set to 3. The test was run with four virtual machines. Over the course of the four-hour test, HyperFlex was able to aggregate more than 420,000 testing IOPS in Vdbench with a total response time of just 447 µsec, as seen in Figure 3. Software-only HCI vendors A and B were able to support just 238,000 and 251,000 testing IOPS respectively. Response times were reasonably comparable across systems, with the notable exception of write latency on Vendor B, which averaged 26.49ms. Compression and deduplication was active on all systems. ESG Lab also examined the same workload on the two alternative systems with deduplication and compression disabled, to determine the potential impact of these technologies running an Oracle workload. 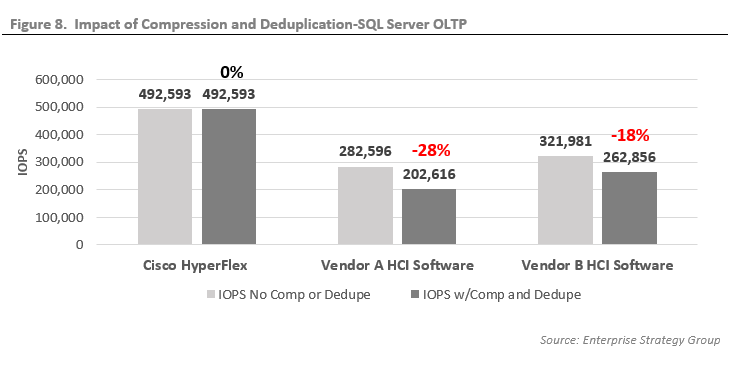 As seen in Figure 5, for software-only HCI vendors, compression and deduplication reduced performance by up to 28%. Compression and deduplication are always on and inline for Cisco HyperFlex, so both results are with compression and deduplication enabled. Next, we looked at an OLTP workload designed to emulate a Microsoft SQL Server environment.6 There are subtle but potentially significant differences that warranted testing against both Oracle and SQL workloads. Vdbench was used to create a workload that exercised different transfer sizes and read/write ratios. In the Vdbench profile, the deduplication ratio was set to 2 with a unit size of 4 KB and the compressibility ratio also set to 2. Again, the test was run with four virtual machines. As Figure 6 shows, the Cisco HyperFlex cluster more than doubled the testing IOPS of software-only HCI Vendor A and nearly doubled the IOPS of Vendor B.
Cisco HyperFlex posted an average response time of 4.41ms. By way of comparison, software-only HCI Vendor A’s average response time was 9.22ms and Vendor B’s was 8.82ms. This time, both Vendor A and Vendor B posted very high write latency for all-flash systems, averaging 17.65 and 21.49ms respectively. Again, we examined the same workload on the two alternative systems with deduplication and compression disabled, to determine the potential impact of these technologies running a SQL Server workload. As seen in Figure 8, compression and deduplication again reduced performance by up to 28%. Compression and deduplication are always on and inline for Cisco HyperFlex, so both results are with compression and deduplication enabled. 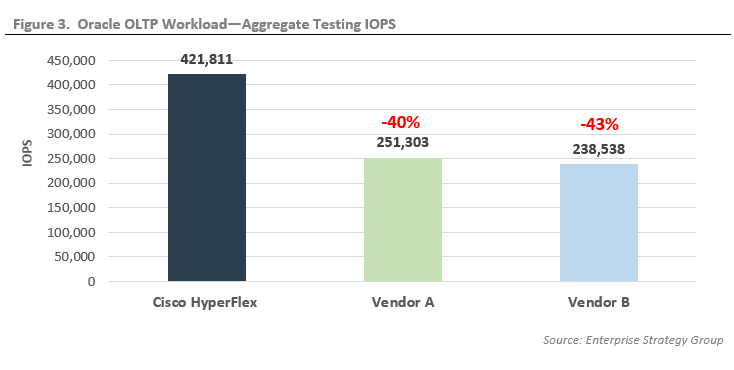 As Figure 9 shows, the Cisco HyperFlex cluster sustained more aggregate testing IOPS over the five-hour test than software-only HCI Vendor A or Vendor B.
Cisco HyperFlex posted an average response time of 2.34ms. 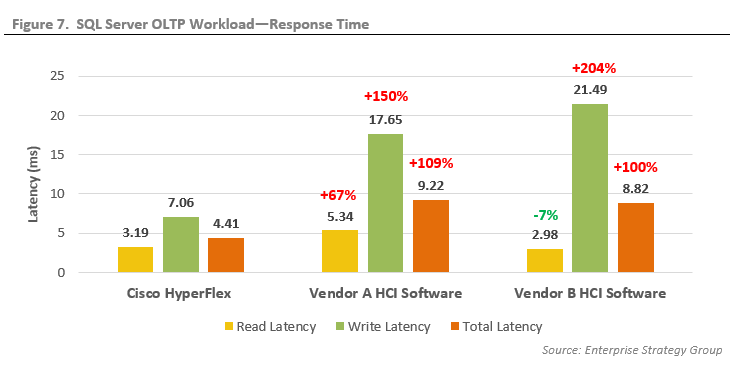 By way of comparison, software-only HCI Vendor A’s average response time was 5.67ms and Vendor B’s was 2.43ms. Again, we examined the same workload on the two alternative systems with deduplication and compression disabled, to determine the potential impact of these technologies running a mixed workload. As seen in Figure 11, compression and deduplication again reduced performance by up to 33%. Compression and deduplication are always on and inline for Cisco HyperFlex, so both results are with compression and deduplication enabled. An interesting observation was made during mixed workload testing. Software-only HCI vendors A and B both showed considerable variability in performance from VM to VM. While Cisco HyperFlex showed little variation across all 140 VMs—aggregate testing IOPS stayed very close to the target of 600—Vendor A testing IOPS (see Figure 12) varied wildly, from a low of 302 to a high of 647 IOPS, while Vendor B showed even more variability, swinging between 266 and 1,207 IOPS. We saw the same levels of variability in the 50/50 tests. It’s important to note that this variability was observed in every iteration of testing and that no form of storage QoS was used during these test runs on any of the clusters. Network QoS was used for all systems. Inconsistency like this could be quite problematic for administrators, who would likely need to use some form of QoS (if available from the HCI vendor) to attempt to control the VMs that are consuming more than their share of resources so others are not starved. Achieving high levels of performance is important to meeting the requirements of organizations looking to adopt HCI technologies and it is essential to achieve that performance cost-effectively. While the performance delivered by an HCI solution affects application responsiveness and end-user experience, it also factors greatly into the overall cost of the solution being deployed. 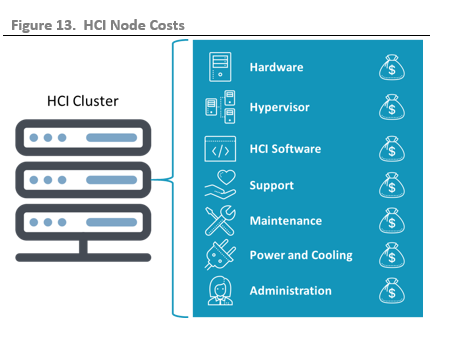 HCI’s node-based architecture means that it can easily scale by adding additional nodes to meet performance needs, but each node carries an upfront capital expenditure (CapEx) burden based on the cost of the hardware platform, HCI software and hypervisor licensing, as well as ongoing maintenance and support plans. In traditional IT infrastructure, higher performance platforms command cost premiums. With HCI solutions, the performance delivered per node will determine the total number of nodes needed to attain defined workload performance requirements—the fewer the nodes required, the lower the total upfront cost. ESG used the IOPS per node performance data gathered from the mixed workload, 70% read, 100% random test (see Figures 9-12) to extrapolate how many nodes would be required per cluster to support higher levels of aggregate IOPS. Our goal was to determine the relative CapEx cost of a cluster to support each level of performance. To do this, we made two assumptions: First, that each cluster would scale linearly, and second, that each solution would have the same cost per node. As Table 2 shows, both software-only solutions require at least one and as many as four more nodes in the 500,000 IOPS performance category, and as many as eight more nodes at 1 million IOPs, as compared with Cisco HyperFlex to support a given mixed workload. While a CapEx savings of 30% is significant, it’s also important to note that the additional nodes required to meet these performance requirements drag operational expenditures (OpEx) along with them in the form of greater staff time to manage a higher node count, added maintenance, additional power and cooling, potential rack space cost if the cluster is in a hosted environment, and additional software licensing for applications licensed by core count. These areas were not analyzed for this report, but it’s important to note that the true TCO savings extends beyond the upfront cost of the nodes. ESG research asked 306 IT managers and executives what benefits their organizations have realized as a result of deploying a hyperconverged infrastructure technology solution and the top two most-cited reasons were improved scalability and improved total cost of ownership.7 Executives want IT to purchase new technologies to modernize their infrastructures and meet business requirements, but they prefer to not spend a lot to do so. ESG Lab validated that Cisco HyperFlex all-flash systems delivered higher performance than other similarly configured HCI solutions using simulated OLTP, SQL, and mixed workloads. HyperFlex not only outpaced competitors in terms of IOPS and latency, but it also offered more consistent, predictable performance per VM and per node than both software-based systems. This translates directly to lower upfront and ongoing costs, because a given workload can potentially be serviced by a smaller number of Cisco HyperFlex nodes. Cisco has an answer to those assumptions. HyperFlex provides the typical benefits of HCI—it is cost-effective, simple to manage, and lets organizations start small and scale. But it also provides the performance that mission-critical, virtualized workloads demand. The consistency of performance over time and across all VMs in a cluster was particularly notable. In addition, its independent resource scalability enables organizations to adapt quickly to changing requirements, as today’s environments demand. Cisco HyperFlex HCI solutions are highly integrated, fully engineered systems powered by the latest generation of Intel Xeon processors and provide pre-integrated clusters that include the network fabric, data optimization, unified servers, and choice of hypervisor including VMware ESXi/vSphere and Microsoft Hyper-V, enabling fast deployment. This makes them simple to manage and scale. ESG Lab validated that HyperFlex provides consistent high performance for VMware environments running mission-critical workloads. HyperFlex outpaced multiple anonymous competitive solutions with higher IOPS, lower latency, and better consistency over time and across VMs. HCI solutions have been focused on second tier workloads, but the consistent, high performance offered by Cisco HyperFlex is extremely well-suited to tier-1 production workloads. Organizations seeking cost-effective, scalable, high performance infrastructure solutions for mission-critical workloads would do well to take a close look at Cisco HyperFlex.